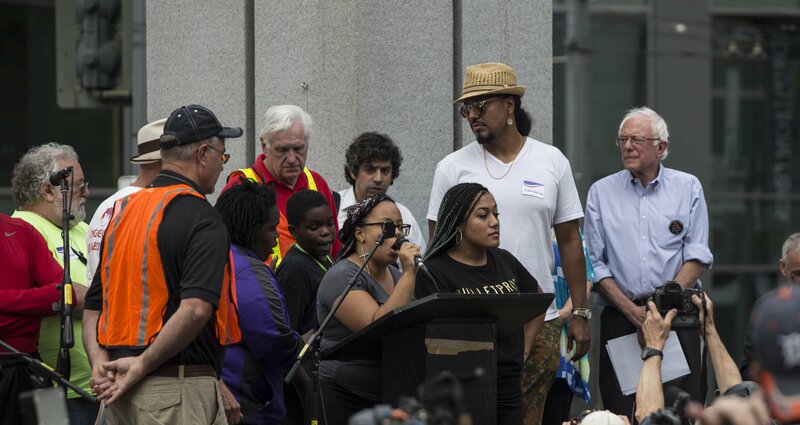 Currently viewing the category: "Privilege and Oppression"
On Saturday, August 8th 2015 two activists with Seattle’s Black Lives Matter activists disrupted a Bernie Sanders speech to call attention to the role of structural racism and to recognize the 1-year anniversary of the killing of Michael Brown. Their action has drawn immediate analysis and posts on everything from whether the tactic was “strategic” to the background/”intentions” of the disrupters themselves. How many of us supporters of Bernie immediately jumped to his defense just because he is our favorite candidate for President? We say “he marched with MLK” and he is proposing policies that will support all lives. How many of us “felt bad for Bernie” and looked for any way to discount the disrupters’ actions? These and so many other comments are similar to what I’m sure many of us have heard over the past few days, especially (though not exclusively) in predominantly White spaces. Instead, we should be discussing the best ways we can propel racial justice in this country as our first priority. Once we are sure we are doing everything in our capacity to dismantle unjust systems of Whiteness, then we can consider other dialogues. Until that day comes, here are a few ways I remind myself of how to engage in critical conversations around race. Discussing race for many is a sensitive topic, so it can be doubly difficult when someone points out how we can do better. I know for me it’s much easier, though not easy, to receive feedback when I ask for it instead of when someone else brings it up on their own. We need to be understanding and as graciously as we can to accept criticism even when it comes at times when we aren’t expecting it. I think Bernie showed this well by releasing a racial justice platform the day after the event. This proved the point of whether the disruption was strategic, since Bernie actually listened and acted (In addition, the Black Lives Matter Netroots disruption of Bernie is what stirred him to start developing the platform). Now we don’t all have the opportunity to release a policy platform, but we can all lend our support for one and get involved in efforts to bring them about. If the worst thing the activists did was prevent Bernie Sanders from making a few speeches, that surely seems justified to bring attention to the death, incarceration, and fundamental injustices faced by Black lives in the United States. I think this is a needed conversation for all us, and we should be using this time to reflect and take action. In particular for those who identify as “progressive” we have to support the Black Lives Matter movement and its push for racial justice. We must avoid solely discussing economic issues. I actually think Bernie Sanders is doing a good job moving in the right direction (after actions focused on him), so we need to follow his example and actually respond to the calls of the Black Lives Matter movement. Even if we disagree about the Black Lives Matter disrupters’ phrasing and context, we should be recognizing the courage of these women to bring this narrative to the forefront. Those of us who identify as White often have the privilege to choose when we engage in conversation around race. This often results in fewer deep and challenging reflections on our systems of Whiteness. The activists on Saturday made sure people at the rally, and those who support Sanders, heard their message for racial justice. Now we have a choice of whether to listen. Want Climate Justice? Then Support Indigenous Sovereignty! The climate change movement continues to demonstrate how to build cross-issue strategies. We must go beyond the desire to “focus on one issue at a time,” even though I know it follows the traditional Alinsky-style organizing model. Nearly everyone I have ever organized with, whether from indigenous or non-indigenous peoples, has described the climate justice movement in terms of a moral struggle against unjust impacts of climate change. With this ethical stance in place, replacing persistent colonialist structures of control over indigenous peoples with sought after self-governance is a natural extension for those striving to fight oppression. At an even more fundamental level, native sovereignty would make natural resource management, such as coal and oil, more in line with desired limited extraction (with the acknowledgement that many communities would still face tough choices of whether to use nonrenewable resources or not). For those like myself who wish to fight climate change on moral grounds, must also extend our efforts to not only the impacts of burning fossil fuels, but also to questioning who controls the land and the ability to extract those resources. Many of you know that the indigenous rights movement is already a step ahead in terms of cross-issue efforts, due to its continual support for action on climate change. Now we just have to get the same commitment from a broader range of climate change folks (e.g. following the great collaboration between 350.org and indigenous organizers). The climate justice movement has often publicly described the disproportionate impact climate change has on indigenous communities and the need to have them more involved in climate discussions. However, I’ve noticed it’s taken a bit longer for those same climate change activists to direct calls to advance the cause of native peoples to control their own resources and land. Currently, I see the alignment between the climate change movement with indigenous sovereignty, stemming from the emergence of the Idle No More Movement in the past year as an example we need to build upon. The Idle No More Movement, led by First Nations in Canada, has put a spotlight on the sovereign rights of indigenous peoples, while denouncing the continuing impacts of colonialism. With many climate change organizations announcing their solidarity with Idle No More, we’ve got to continue the momentum and push for granting indigenous self-sufficiency. There are many places where the climate movement could support the move for indigenous sovereignty; however, the best place to start is to follow the calls from indigenous communities themselves. From within the climate movement, we need to incorporate clear and persistent calls to action, messages, and analysis of how to build a cross-issue emphasis that takes into account the struggle of native peoples for their rights (e.g. the Idle No More Movement). This should come from folks at all levels of organizing. With an anti-colonial perspective, the climate movement can advocate for the moral claim for indigenous sovereignty and their right to decide how to use their natural resources. Native communities have joined in the climate change struggle, now is time for much more of the climate change movement to join with their allies for Native rights to self-determination. I can still vividly remember one of my first Anti-Oppression (AO) workshops, where I first went into depth about my male privilege and how it completely changed my perspective of my activism. This workshop, at the Sierra Student Coalition grassroots organizing Summer Program (SPROG), led me to continually think about how I could incorporate an AO approach into all of my organizing work. I started out slow, but eventually I felt fairly comfortable (or at least willing to be uncomfortable) bringing up issues of oppression (e.g. heteronormativity, ableism, etc.) in the activist groups I was a part of. While many of our social justice movements have a long ways to go in terms of grappling with entrenched structures of power and injustice (e.g. the need to confront intimate violence within activist communities), I know there is a growing conversation already happening. We actively need to encourage those discussions, and create spaces that show oppression as something far more than just interpersonal privilege, but also deeply intertwined with nearly every part of our lives. However, we have to do more than “create dialogue” or “raise awareness.” This means we need to address language and individual actions yes…but we also need to address our political, educational, and economic systems. Whatever occupation we may be involved with, we need to find ways outside of our activist spaces to transform the oppressive elements of our society (e.g. Seattle’s citywide effort to end institutionalized racism). While this may be more challenging for some (e.g. having a tenuously-held job and needing to support a family), those of us with the privilege to be able to speak/act out against injustice, must make sure to be persistent and not slide into being neutral. In particular, this “naming” of oppression outside of activist spaces often seems to be something those with privilege do less frequently than we need to. From my own life experiences, one reason for this is we often have the choice to separate our activism from our daily lives (which I still have to work hard to resist). However, we cannot keep waiting for the “right moment” to speak/act out since it will never come. As many changemakers have illuminated, privilege remains invisible unless we take the initiative to expose it. Thus, the more you are immersed in the dominant culture and power system (e.g. serving as a manager or executive in an organization, being part of a group with a high percentage of male leaders, etc. ), the increasing importance it is for you to break that cycle of silence in the face of oppression. I know for myself I often have to spend a significant amount of time building up my own confidence and talking to those who support me, in order to know how I should start the process of addressing institutions of oppression within my organization (e.g. contributing to the prison industrial complex or the widening U.S. wealth gap). Too often, it is only those most impacted by oppression’s effects who speak/act out against it. We have to change that imbalance so that all those with a high degree of privilege, and want to be committed to justice, actually put themselves in a position to reduce the silence around oppression. It may not be easy to do, but I know whenever I am able to speak/act out against injustice in any of the more privileged organizations I have been involved with, I always can feel my growing ability to continue highlighting oppression and privilege no matter where it comes forth. What are your stories of addressing oppression and privilege in your organizations? Leave a comment below! My post last week looked at 3 ways of limiting changemakers. This week I wanted to analyze methods we can use to counter these “3 As” of apathy, acceptance, and activist diversion. Spend time working with the individual or group and show your commitment to them. Moving away from an indifferent mindset takes time, so don’t give up on them even if it takes a while. Involve people in communities actively on the path or bringing about change. One person is not always the most convincing, so bring those with an undecided views to groups actually working and so they can see the results themselves. Ella Baker said “Give light and people will find the way.” If you can illuminate a propelling image of potential actions or a better world, then people will often express their own motivation. You cannot really motivate someone, but you can aid them in realizing the motivation within them. Try to identify the source of their acceptance (e.g. not believing anything can be done or that they can contribute, thinking that “everything is already being done,” etc.) and see if they are interested in learning about other ways to become more involved in changemaking. For those that cannot imagine big changes actually happening, show them examples from history and current efforts of groups and movement making significant gains. Often knowing that someone else is not going to intervene (e.g. government) helps move folks beyond the bystander effect to actually investigating how they can take concrete actions. Consider sharing your personal stories of acceptance since the person you are talking to be at a moment when all they need is to realize that many people feel “acceptance” once or multiple times. I know I go through cycles of emotions around acceptance and I have often needed the support of my community to get back to the work my heart tells me I can do. Work with folks to demonstrate that there are real options for our activist work. Activists want to contribute and support work that brings about a positive world. However, if the only options are going into moderate nonprofits or public policy organizations, then we are deeply limiting the scope of our activist work. Collaborate to identify pathways to change the current organization. Sometimes it’s not possible to simply change who you are working with (e.g. needing an income to support a family); however, we can create plans to move the groups we are involved with to become more impactful and not perpetuating inaction. While it goes against common paths (and what might be easier), show why activism cannot be a career. Madonna Thunder Hawk’s article Native Organizing Before the Non-Profit Industrial Complex gives an undeniably clear explanation that as soon as we make activism a career, our interests become more and more invested in maintaining the current organizational status quo and are less willing to do “unfundable” initiatives. It’s essential we speak up and actively show new ways of making social change in our organizations. I’ve often tended towards the apolitical, but I’ve learned from current and past activists how that supports the powerful. We have to find avenues to mobilize our organizations to reject “neutrality,” reliance on policy reform, and moderate dialogue that ignores institutional oppression (e.g. white privilege). Apathy, Acceptance, and Activist Diversion take shape in nonlinear fashions, and I know from my own experiences going through these flows that it often takes persistent, dedicated work from both myself and those I know to head in the directions I seek. Really responding to the “3 As” is about sharing yourself and making sure you don’t feel silenced since most dominant narratives lean towards promoting Apathy, Acceptance, and Activist Diversion. I see folks in these categories, and other mixtures, nearly everyday which has prompted me to ask “how do we respond to this convergence of inaction and/or ineffective action?” Leave a comment below with your thoughts. Have You Noticed These 3 Ways of Limiting Changemakers? I’ve seen the changemaker diversion industry…as I was nearly diverted myself. It’s not that nonprofits or social service jobs are wrong (they have an important role), it’s just that the vast majority of this industry today says we can only win small reforms for those most in need and significant change is not possible or is too “political.” This is also that this industry often forces us to hide our own true views because “we don’t want to upset funders” or those with a different view from us. While I was one step away from fully committing to this particular mode of thinking directed at small changes, there are other ways that can reduce the number of changemakers seeking deep changes. The “three As” of apathy, acceptance, and activism careerization currently pose serious questions for changemakers. For those of us looking to mobilize people, we have to grapple with the challenges of raising understanding, getting folks to act, and making a tangible difference with our own efforts. Below I have written out a few attributes of folks facing the “3 As” and some reasons for their continued presence. One of the biggest challenges we face as organizers and as a society is indifference to injustice. The celebration of apathy and people not knowing what they “stand for” can be truly frustrating for those wishing to change the rampant exploitation of people across the world. The idea of acceptance is the sentiment of “compliance” with current systems or that society just has to “wait for change to happen on its own.” People with this mentality may understand some of the world’s injustices, they just tend to believe that they are already taking the best possible course of action or its impossible to shift those in power. Some of the causes of acceptance include folks who have been influenced by media or culture to not resist, those who do not believe much more can be done, or those who believe that current mechanisms and reformations will actually make changes. The careerization of activist work, a hidden form of inaction, redirects folks’ driven to solve the “root causes” of problems, into putting their energy in limited, tightly regulated ways that only address the “symptoms”. While providing social services, policy work, or receiving funding/legitimacy, are not bad per se, they do ensure that activists only work in a certain prescribed manner that is not directed at making significant changes in ending cycles of oppression/degradation. We need BOTH social services and social change. However, right now it’s a lot easier for me to find a social service organization than a social change one. Next week I’ll be looking at ways to confront the “3 As” that help move us away from responding to the same symptoms year after year, and toward social change that addresses the root sources of our interconnected issues. Click here to sign up for Organizing Change’s e-mail newsletter to see how to challenge the “3 As” and to keep updated on current efforts in the organizing/activist field.